One Sunday, as we were singing, I saw Jesus, and He was looking at me. He was the Jesus of Revelation chapter 1, with fire in His eyes; His gaze was penetrating, seeing into my head, seeing into my heart. There was love in His eyes, and fire, and He was looking deep within me. The scripture says that the eyes of God are going to and fro throughout the earth (2 Chron 16:9), looking for those who He can strongly support: those whose hearts are completely His. That is what He is doing in this time, looking for willingness; willingness to say, ‘My heart is Yours. There may be stuff in it that needs dealing with, but I am willing for You to do what needs to be done, to restore me and make me whole. I am willing to step out and do Your will’. God’s eyes will penetrate your heart. If He looks into your heart and mind, what is He going to see there? Certainly you are not going to be able to hide anything from His eyes. And because He is also a warrior king, He is coming with a sword in His mouth; His words too will penetrate your heart and life, bringing division between the positive and the negative, the good and the bad, what can remain and what must be got rid of. God never acts without revealing his plans to His prophets. Some of you reading this, you are on a crash course. You have been saved into this environment, into this understanding of God’s revelation and His purposes in our days. It will not take you the twenty years or more that it has taken some of us to come into the reality of the presence of God. And things are only going to accelerate, if we are willing. We do have that choice – we can resist Him and stop Him having His way in us, prevent Him from purifying and refining us, clearing out the dross and revealing the image of His Son in us. My advice is, don’t hide, don’t resist; allow God to deal with what is in your heart. 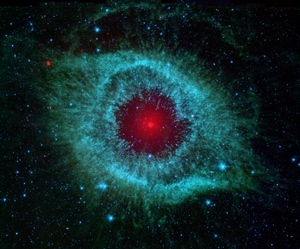 In what is coming, a level of holiness – a level of being set apart – will be required that we simply do not have as yet. The highway of holiness is higher than we have imagined. Jesus is returning. He will return, at the end, but He is returning all the time. He is coming to us all the time. Open your heart, and He will come to you. The reason He is coming is to prepare us for the conflict for souls. The harvest that is coming is a battle for souls, make no mistake about it, and there will be conflict. People are falling into a fiery pit every day, and they are making that choice to go there. 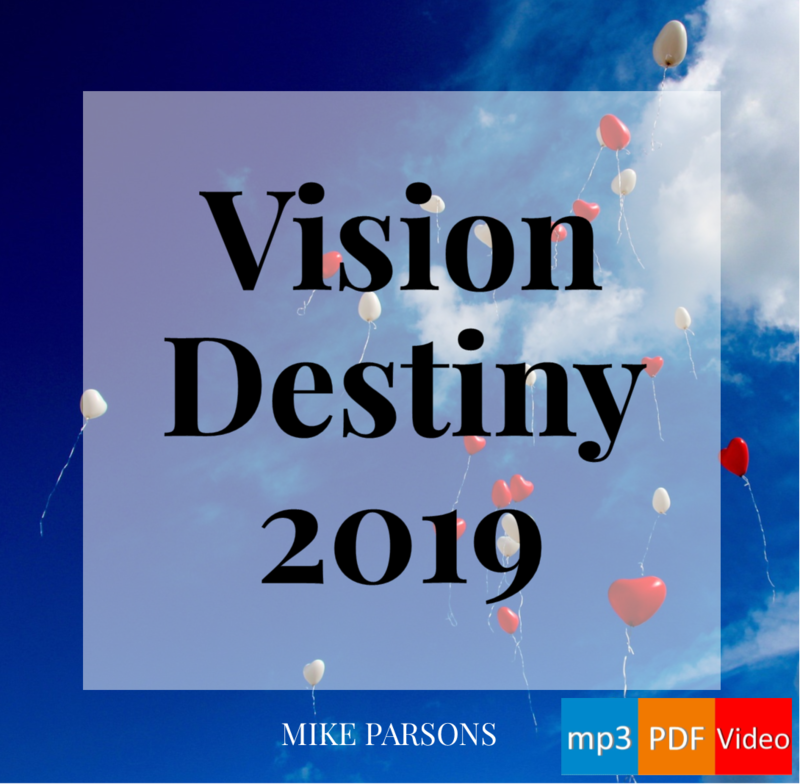 I had a vision while I was on my 40 day fast, a vision of people, hundreds and thousands of them, walking across a plain. In the distance I could see that fiery pit, and people were just walking straight up to it and falling in. And I saw other people, Christians, standing in front of them and planting a sword in the ground right in front of them and saying, ‘Stop!’ Some of them did stop, but they looked around them, then they stepped to one side and carried on going. Others did turn around though. With some of them it took 3 or 4 people to plant a sword in their path and cry, ‘Stop!’ before they turned and went back. The enemy has blinded their eyes. Our part is to bring the light. This is a real battle, this battle for souls: we are not playing games, not just having nice times with God for our own personal enjoyment, for the sake of the experience. Yes, He wants us to experience Him, but He wants our hearts and lives transformed for purpose, for His eternal purpose. People’s destiny is at stake, and we must shine so brightly that we get their attention so that they see that God is real and that they too can be transformed through His love. What did Jesus say? ‘Look around you, the fields are white but there are not enough labourers’. He is seeking out those who have a heart for the harvest, to bring it in. In everything God is doing and planning to do, this is what it is about: bringing in the full harvest, seeing all those people saved, and healed and delivered. The first stage we have looked at in God’s Prophetic Timetable is that call to intimate knowledge of Him, to really know Love. But the second stage has already begun for some people, even as that first one continues. Every stage of this plan takes us closer to the return of Jesus. We have already seen that God has established forerunners of everything He plans to do, little tasters if you like, to give us an appetite for what he intends to bring about on a much greater scale. So everything we have seen so far is tiny in comparison to what is coming. That second stage is the removal of stumbling blocks, and the revelation of a generation of those who will bring in and train the harvesters. You have to understand, there are two phases of the harvest. There will be a final harvest at the very end of the age, but first the harvesters themselves need to be brought in. We will consider this next time. We are getting to the core part of what we set out to share with you. Everything we have posted so far has really been by way of introduction. 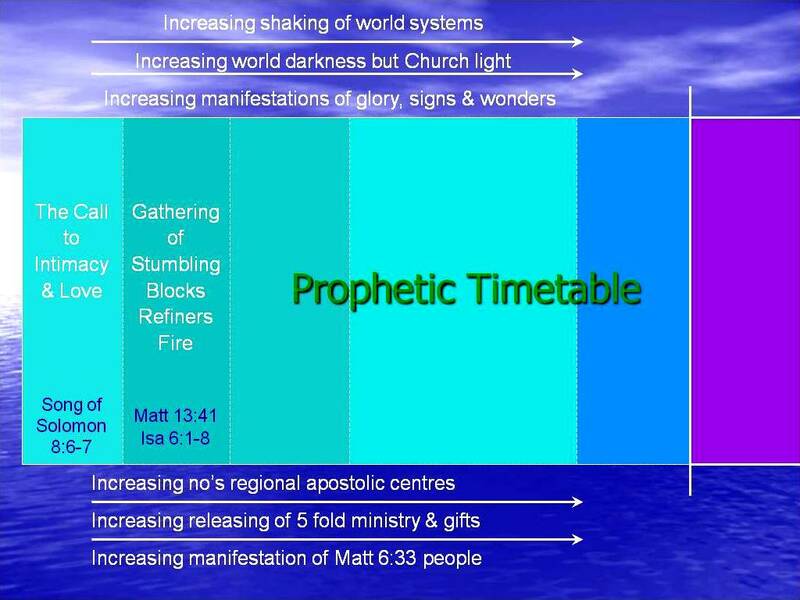 We are now beginning to look in detail at the prophetic timetable that God is opening up to us, the revelation of His plans and purposes over the coming months and years. Let’s remember, there are no specific dates or times here, just a sense of different phases or periods in which God will be working in particular ways, which He is calling us to recognise so that we can cooperate and participate with Him. Each of these is a period of time which does not end, but continues alongside the other periods of time. Over these periods, there are going to be an increasing number of apostolic centres, where God is equipping people in apostolic power and ministry, and in the gifts of the Holy Spirit. Increasingly, fivefold ministry gifts are going to be released to the body of Christ. There will be increasing manifestation of a people who are seeking first the Kingdom of God and His righteousness. There is going to be an increased shaking of every worldly system: financial, medical, political; in fact any system that is out there is going to be shaken. And the only things that can remain are the things that are based on the Kingdom of God. There is going to be increasing world darkness, but church light. We are going to shine in the darkness and there are going to be increasing manifestations of the glory in signs and wonders, which is going to demonstrate God’s Kingdom in heaven here on earth. This second diagram is just a different way of looking at those same periods Now there are a couple of things I want to touch on. The first one of those periods has already started, it is already here, a call to intimacy and love. Again, you can see it will not stop, it will go on underneath all the other things God will be doing, until Jesus returns. You can read Song of Solomon and just get information, or you can catch His desire for intimacy; you can read it and expect to experience the presence of God for yourself. Many people are experiencing the presence of God and his love today far more than they were last year. That is happening, and it is to prepare us for the coming of the sword, because there is going to be a gathering of stumbling blocks and the refiner’s fire. You do not need to be frightened of that, you can fall on the rock and be broken! I would rather do that than the rock fall on me and be crushed, but whatever way, God is going to do it, and it is up to us which way it is to be (see Matt 21:44). We can surrender to it, and allow God to do it, or not. We need to be a habitation of God, a dwelling place of God’s Presence. We need to know God is in us. Father, Son and Spirit came to dwell in us: as it says in John 14, ‘they made their abode’. Jesus went to prepare us to be a place where the Holy Spirit could dwell, and the Father and the Son could dwell. In Acts 2 there was wine, fire, and wind of the Spirit. The early rain was great, but there is going to be a latter rain which is even better. So all the wind and the fire and the rain of the first outpouring of the Holy Spirit is only a taster of what is going to be poured out in the end. ‘You ain’t seen nothing yet’. I have engaged with three of these periods so far personally. 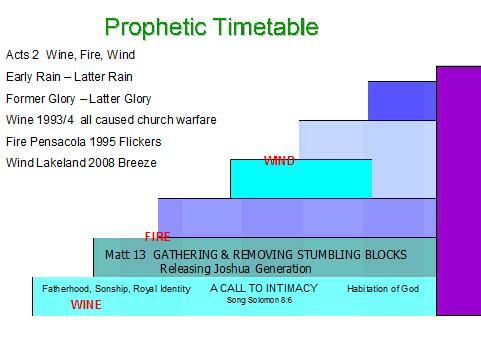 I experienced the wine of the Spirit in 1993 through a guy called Rodney Howard-Browne. He was known as ‘Joel’s bartender’ because he brought the pouring out of the wine of the Spirit to the Pentecostal arm of the church, with a lot of laughter. In Toronto they picked up on that, and it was wild. As a church, Freedom was birthed from that in More for ’94: and it really was wild, it was like a zoo. Bob Jones prophesied in 1983 that this was going to take place, and when it did it caused warfare in the church; it caused division. Most of the people in the UK were on the side of God: for instance the Church of England came out and said ‘These are manifestations of the Holy Spirit – we are going for it’; Holy Trinity Brompton, particularly, were in the forefront of that. Awesome! But in America it was totally different. It caused division, so much so that the Vineyard church threw out Toronto from their whole movement… and in my view have never been the same since. Pensacola. The fire. Now I went to Pensacola and it was the most intense fire of the Presence of God I have ever experienced anywhere. You could not walk into that place without wanting to get on your knees in repentance. People ran to the front, including me, to repent; and I couldn’t even think of anything to repent of! I ran to the front and just got on my knees and cried to God because my spirit was so touched by the fire of his Presence. That was just a flicker of what is coming. Lakeland: the wind. Some of us were touched by what happened in Lakeland. Whatever you believe about what went on in Lakeland, it was God. Man got involved and there were unwise things that happened but it was God. You can’t reach out and touch your TV screen and be changed if it isn’t God. How many of us did that? We did that. It was the Presence of God, it was the wind. Now that disrupted everything, it was a worldwide phenomenon, thanks to God TV and the internet. The wind blew, but that was just a breeze compared to what is coming. A wind is going to blow, and nothing is going to stop it. You can’t tell where it’s coming from, you don’t know where it’s going; but it is going to blow powerfully, more powerfully than any of us really know. Before Jesus returns, that wind is going to blow. The former glory is going to be nothing compared to the latter glory of the house: the Kingdom of God revealed, on earth as it is in heaven.